“When a magician lets you notice something on your own, his lie becomes impenetrable.” – Raymond Teller, Born Feb, 14, 1948. A lot of people think persuasive writing is about what you say to people. Your words push their buttons and they act. But a lot of times, it's what you DON'T come right out and say that is much more likely to lead to action. 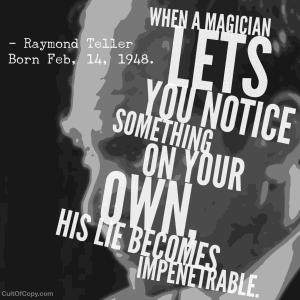 For example, think of the last time you saw a magician perform a magic trick. It can be in person or on TV. Were you delighted to be fooled, or annoyed to be deceived? Were you impressed by the skill, or bored by the juvenile stunt? See, like I just did above, you want to draw the broad shapes and let them color in their own details when you can. Chances are, a lot of the people reading have a specific magical performance in mind – they might even have remembered several. That's how this trick works. You want to coax your audience into participating beyond just passively reading or listening to your message. By leaving specific holes in your stories, you can FORCE the audience to insert parts of themselves into it – they NEED to in order to make sense of it and give it context. And because heave been tricked into integrating themselves into your narrative, the inverse happens also – your narrative becomes part of them. They internalize it. They take ownership of it. So the conclusions that the story leads them to feel personal. They feel weighed and measured. They feel reasoned and thought out. They feel like they made up their own mind. But they didn't. They merely filled in the colors of their own, inside a shape you dictated. They maybe even feel like they chose the colors, but they picked from the ones you chose to hand them. They feel like they have spotted the pattern on their own. They feel like they are completing the script because they chose to. They feel like they are arriving at their own ending, rather than the one you wrote for them before they even met you. And this is literally the best and simplest way to convince people to do whatever you want them to. Let them believe they CHOSE to. And they are happy you presented them the option to do what they really wanted to all along. So convenient and helpful you are. My advice is for anyone who uses persuasion deliberately. Mostly my audience are other people who work in advertising, like myself. But really, anyone is welcome to get whatever value they want from my work here, even if the conclusion is simply to disagree with what I’ve said. At least it gets people thinking about communication in a way they weren’t before. I read a couple of your posts. I can’t say I really liked your advice; to advertisers, I would presume. I’m sure it does work. The media is inundated with, I guess you would identify it as "copy."